Bio Notes: John Taylor was born on 15 November 1833 at Warkworth, Northumberland, where he obtained his training working for the Duke of Northumberland. 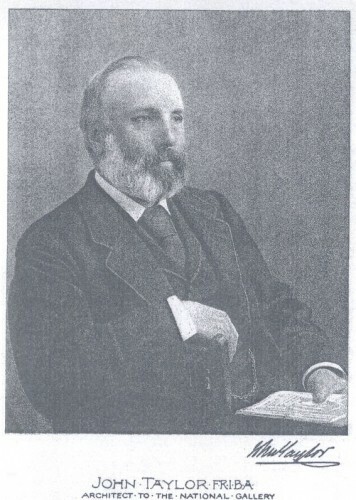 He joined H M Office of Works in London in 1859 as Assistant Surveyor of royal palaces, public buildings and royal parks, and was appointed Surveyor in 1866 and Consulting Architect in 1898. He remained there until 1908. Taylor was admitted FRIBA on 3 January 1881, his proposers being J Whichcord, Arthur Cates and Charles Barry. He was knighted in 1897. He died at Surbiton Hill, Surrey on 30 April 1912.